Justina Satkevicuite – Aura Dental’s Hygiene Therapist. What can I do if I have sore or bleeding gums while at home? If you have sore, swollen gums or if they bleed when you brush your teeth it might be the early sign of gum disease. It is vital to make an appointment to see your dental hygienist or a dentist for a thorough gum health examination. Your clinician can then advise you on the best course of action to reduce and/or reverse the effects of gum disease. It is important to maintain as good oral hygiene as possible until you see you your hygienist or dentist. I brush my teeth twice a day and I still wake up in the morning with bad breath. What can I do to help this? Poor oral hygiene, gum disease, tooth decay, or mouth infections can be causes of bad breath. Diet as well as tobacco and alcohol use may also be factors in causing bad breath. First of all it is important to visit your dental hygienist or a dentist if you develop a bad breath. Your dentist or dental hygienist will be able to find out the main cause of bad breath and help to eliminate it. My kids hate brushing their teeth. What can I do to encourage my kids to take better care of their teeth? It is also good to get your kids used to visiting the dentist and hygienist from early on. This will get your child used to the noises, smells and surroundings and prepare them for future visits. It will also give them the chance to focus on learning about their teeth in an appropriate environment. There are so many electric brushes available now. Which one is the best? In my opinion there is no best brush. It all depends on patients’ needs and individual choices. Expert recommendation to suit your teeth from your hygienist or dentist. Size – make sure the brush head gives you easy access to all surfaces of your teeth. Effectiveness – rotation/oscillation is traditionally the most effective for brushing but new vibrating or sonic movement brushes have been proven to be very effective as well. Likability – if you enjoy using your toothbrush, you are more likely to use it all the time. Battery life – if you travel a lot battery life could be very important. These days, you can get electric brushes with wifi or blue tooth connectivity. These are meant to increase your engagement in your tooth brushing, prompting you on things like brushing time and pressure. These are all well and good, but it does not replace the self motivation needed to ensure you are brushing you teeth properly. I do a lot of exercise and sports and consume high sugar foods and drinks to replenish my energy. How can I best protect my teeth? Drinking plenty of water and ensure your mouth is not dry. Saliva or water neutralises the acid on your teeth (particularly after eating/drinking sugars). Brushing your teeth more often especially after consuming sugary drinks or snacks or at least make sure to rinse your mouth out with water. Use fluoride mouth rinse to remove as much sugar as possible. Chewing sugar-free gum can help you increase the production of saliva and removing any sugar coating on your teeth. If possible choose less sugary snacks like fresh fruits. The key to protect your teeth from cavities after eating sugary foods is simply to prevent the mouth from remaining coated in the acid-forming sugars found in sweets and energy drinks after eating/drinking. This entry was posted in Blog, Gum Health, Hygiene, Oral Health on 4th April, 2017 by Aura Dental. Dentists are a vital part of your healthcare team from cradle to grave. Aura Dental in St John’s Wood offers a full range of general dental services for patients of all ages, with a firm focus on preventative dentistry – aiming to stop problems before they start. Our St John’s Wood clinic has a skilled team of dentists who can prevent and treat all manner of dental issues. There are also options available for people who suffer from dental phobia or anxiousness about treatment. Fear of dentists is very common and is nothing to be ashamed or embarrassed about. A good dentist will never judge or criticise you if anxiety about treatment has stopped you visiting a practice for many years. Modern dentists are very knowledgeable and sympathetic to the needs of those with dental anxiety or phobia, and want only to help you find your perfect back to treatment to restore your oral health. You should start bringing your child for check-ups as soon as their first teeth begin to appear. The dentists at our St John’s Wood clinic are highly experienced in working with children, and can help to minimise your child being anxious or phobic about treatment later in life, by ensuring that all of their early experiences with dentists are positive ones. Our St John’s Wood practice offers a number of preventative treatments designed to strengthen and protect children’s teeth, including fissure sealant and fluoride varnish. It is also often possible to spot the signs of potential orthodontic issues at an early stage, making them easier to treat. Regular dental check-ups are also vital throughout the teenage and adult years. It’s common to have orthodontic treatment as a teenager, and your St John’s Wood hygienist can help you to clean around them efficiently. It’s important to monitor your oral health for signs of tooth decay and gum disease as an adult. Our St John’s Wood clinic also offers special care to groups who have specific needs, such as those with weakened immune systems or those who are pregnant. When tooth loss occurs, dentures or dental implants may be used to replace them. This entry was posted in Oral Health on 21st September, 2016 by Aura Dental. Visiting your dentist regularly is as much a part of staying healthy as going to the gym or eating a healthy diet. At Aura Dental in North London we welcome new patients of all ages for the highest quality private dental care. A recent survey, conducted by the Oral Health Foundation as part of National Smile Month 2016, showed that in general UK residents are good about visiting the dentist for regular check-ups. In fact, the UK was ranked second most likely to go for timely check-ups, with 72% of adults saying that they attend regularly, second only to the Netherlands at 79%. The general advice is to visit your dentist for a check-up every six months. Of course, every patient’s needs are different, and some people need to visit more frequently, particularly if there is a condition such as gum disease that needs monitoring. You should always follow your dentist’s advice, and should also book regular appointments with the hygienist for a professional tooth clean. At our North London dental practice, we understand that many of our patients have very busy lifestyles, which is why we make it as easy as possible for you to see a dentist at the most convenient time for you. Our North London clinic is open until 6pm Monday-Friday, and also offers Saturday appointments between 9am and 1pm on alternate Saturdays (please contact us for details and availability). To ensure that you never forget an appointment again, we send out email and SMS reminders prior to your visit. If you are a first-time patient at Aura Dental North London, a member of our reception team will be in touch prior to your first appointment to get to know a bit about you. You will also be asked to complete a medical history form. At your consultation, your dentist will perform a thorough clinical examination, including an oral cancer check as standard. X-rays, scans, and photographs will be taken as necessary to aid with diagnosis, and any treatment requirements will be detailed in your personal treatment plan. This entry was posted in Oral Health on 8th June, 2016 by Aura Dental. Granted the dentist may not be the first person you’d think of consulting during pregnancy. However, at Aura Dental in North London, we are keen to stress the importance of regular dental health checks during pregnancy – as well as for baby when they arrive. Pregnancy is a very exciting time, but it does sometimes throw up some health issues, including dental health concerns. The levels of the hormone progesterone can be up to ten times higher than normal during pregnancy, which affects the body’s response to toxins, including plaque. Pregnancy gingivitis (gum disease) is a common complaint, and by visiting your dentist as soon as you notice anything unusual, you can effectively treat and manage the condition, so that you can get back to enjoying being pregnant. Symptoms include gums that bleed when you brush your teeth, or which may be red and swollen. We have also seen pregnant women at our North London clinic who have developed pregnancy granuloma – red nodules that commonly appear on the upper gums. These are not dangerous but can be uncomfortable, and your dentist can help you manage them. If you experience bad morning sickness, enamel erosion and dry mouth are common side-effects. Eroded enamel can lead to increased tooth sensitivity. Again, by coming in to visit a dentist at our North London dental practice as soon as you start to experience such symptoms, we will be able to help you manage the condition. Remember that every pregnancy is different, so even if you experienced no problems in the past, you should still be on the look-out for warning signs. Once baby arrives, it is a good idea to bring them into the dental practice from an early age. Dental check-ups from a young age have been shown to help prevent fear of the dentist in later life, and can also help to prevent problems before they start. The team at our North London practice are experienced in working with children. Your child’s dentist may recommend using preventative treatments such as fluoride varnish and fissure sealants, and can also spot orthodontic problems early. This entry was posted in Oral Health on 20th May, 2016 by Aura Dental. A smile makeover consultation with a cosmetic dentist at our North London clinic is an excellent option if you are interested in cosmetic dentistry, but unsure what the best treatment options are for your specific needs. The team at Aura Dental in North London comprises highly-experienced cosmetic dentists and dental professionals, all of whom have one goal: to create a beautiful, unique smile for you, one that you will be keen to show off. A cosmetic dentist likes nothing more than seeing a patient’s confidence – indeed, their life – transformed with the help of a smile makeover. Cosmetic dentistry means different things to different people. At our North London clinic your dentist will use the latest technology, materials, and techniques, and will work with you to create the gorgeous, individual smile you’ve always wanted. 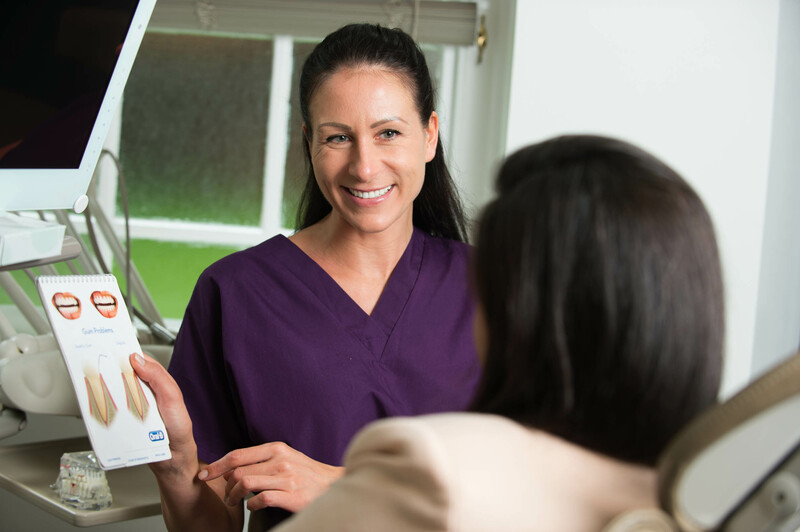 We use intra-oral 3D scanning at Aura Dental North London, which creates a precise three-dimensional image of your teeth instantly (and is much more pleasant that the traditional method of taking tooth impressions). Combined with digital smile design, this enables your dentist to show you what results you can expect before you start treatment. Because cosmetic dentistry is a vast field, you may benefit from combining two or more of the aesthetic options at our North London practice. Your dentist will take the time to find out what you like and dislike about your current smile, and what you want to achieve from treatment, in addition to conducting a thorough clinical examination. This entry was posted in Oral Health on 15th April, 2016 by Aura Dental. Fear of the dentist can sometimes be sparked by a bad experience during childhood. At Aura Dental in North London, our entire team is experienced in working with children and young patients. We believe that bringing your child into the dental practice from a young age will help them to learn that it is nothing to be scared of, and will hopefully establish habits that promote good oral health for life. You should bring your child to our North London dental clinic soon after their first teeth start to appear. By attending an appointment at the same time as a parent, guardian, or sibling, a young child can learn to observe and copy what they see – sitting in the chair and opening their mouth for the dentist to look at their teeth. The level of dental decay among UK children is still shockingly high. At our North London dental practice we believe that no child should have to suffer from untreated decay. We focus on preventative dentistry, helping to teach your child about the importance of cleaning their teeth in a fun and engaging manner, and spotting any signs of decay early. If they do have any decay, this will be treated promptly and gently without any pain, avoiding the need for more traumatic treatment such as extractions. We provide fluoride varnish and fissure sealant at our North London clinic, both of which are designed to help prevent decay. Your child’s dentist will also be on the lookout for early signs of orthodontic problems such as underbites, overbites, or cross bites. As with most dental issues, the earlier they are spotted the easier treatment is. Our North London dental team also provide special oral health advice for teenagers, helping them to keep their smile healthy. This entry was posted in Oral Health on 30th March, 2016 by Aura Dental. A smile is a curve that sets everything straight—and behind every bright smile is a set of perfectly healthy teeth. The condition of the teeth affects your over-all appearance. Various studies have proven that those simple pearly whites can either boost or lower self-esteem significantly. At the same time, they influence the perception of people around you. Just by looking at the teeth, people can form opinions about how health-conscious or attractive you are. Sometimes, this even extends to how successful you can be in your career. With the look of the teeth affecting perception of the self and others, people seek ‘perfect teeth’ all the more. A study conducted by University of Manchester’s School of Dentistry asserts that a full set of white teeth improves quality of life, as it increases self-esteem. The researchers explored the emotional effects of dental implants among patients who had partial teeth loss and edentulism. They asked participants to complete an Oral Health Impact Profile, which assesses the individual’s perception about their oral health quality of life. Before the treatment, the mean average was at 241 out of 343, signalling poor QOL. After the treatment, however, OHP increased to 342, indicating increase in confidence, self-esteem and general happiness. Aside from having a complete set, the idea of ‘perfect teeth’ is defined by its colour and alignment. People believe that white and straight teeth are attractive. Researchers from the universities of Leeds and Central Lancashire in England confirmed the appeal of white teeth. In the study, the experts gathered photos of models and manipulated the colours of the teeth. They used three shades—yellowish brown, normal white, and bright white. They showed the pictures to 150 young men and women and confirmed what popular opinion dictates: white teeth are most attractive. The reason yellow or unhealthy teeth is undesirable goes beyond mere appearance. Participants formed perceptions that yellow teeth are unhealthy, and therefore not a good potential partner. As mentioned, straight teeth are also ideal. In a study conducted by Kelton Research, they found that people associate financial success with those who have straight teeth. They are also more likely to secure a job than those that have misaligned teeth, even if both candidates have similar skills and experience. How the teeth look can affect perception—both of the self and others. Schedule a consultation today and find out how we can help you achieve the perfect set of teeth. We have different solutions, from dental implants to teeth whitening and braces. This entry was posted in Oral Health on 9th December, 2015 by Aura Dental. If you have been looking for ways to raise your confidence, you probably have taken the advice of numerous people. The problem with that is those methods, though effective, worked specifically for them. Now, it is not to say that for you to feel better about yourself, you need deep introspection. It is the opposite actually, because at times, you just need to smile more. Social psychologist Amy Cuddy, speaking at a TED conference, enlightened her audience about how standing in a posture of confidence works. Even when you are literally faking it, open statures, such as smiling and generally occupying more space, gives us more self-belief. The ‘power poses’ are all physical, but its effects are primarily neurological. Your testosterone levels spike and your cortisol, the stress hormone, is low. It is the best recipe if you want to feel better or have a better face to show everyone. Many leaders have the same hormonal situation, and they are never short of confidence and are good stress managers. Maybe, the root of your low confidence is the fact that your smile, a determinant of a person’s happiness, is not up to scratch. You are not the only one to have this, and you certainly would not be the last. Yet, the worst thing you can do is avoid the problem. It is such a small thing to be affecting you so much, so we here at Aura Dental suggest you have it sorted. Whether it is teeth whitening, fast-acting dentistry or a smile makeover, know that we are here. Visit us at St. John’s Wood in London today. For more information, go to our website: www.auradentallondon.co.uk. This entry was posted in Oral Health on 4th December, 2015 by Aura Dental.